Serious UV protection and superior hydration join forces in this sheer facial sunscreen. 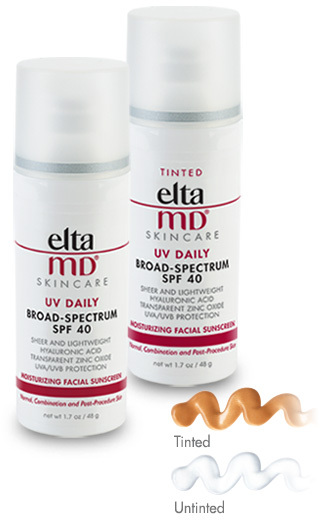 EltaMD UV Daily has hyaluronic acid to boost moisture retention and diminish fine lines. This lightweight moisturizer with UV protection can be worn alone or under makeup. This amazing formulation protects against free radical damage sustained from the environ- ment and the the natural aging process. It combines the powerful antioxidant proper- ties of vitamin C with the specially selected human growth factor – TGF-beta-1 to enhance collagen production. This intense eye cream dramatically improves the appearance of under eye dark circles, puffiness and fine lines. This formulation combines All-Trans retinol, green tea, arnica, and vitamin K along with a system of chelators and peptides to deliver maxi- mum results. This light, quick absorbing lotion spreads eas- ily over large areas of the body. Contains 15% Glycolic Acid along with Vitamins A, C, E and Green Tea Extract. For the dry skin patient who requires a heavier but elegant moisturizer. Contains Vitamins A, C, E, Co-Q10 and Green Tea in an aloe base (pulp of the plant). Retinol (Vitamin A) helps to reduce the appear- ance of redness, lines and surface wrinkles, as well as revitalizes, firms, smoothes and enhances skin tone and texture. This serum has been enhanced with green tea polyphenols, caffeine and moistur- izers to increase the antioxidant properties of the serum, and hydrate the skin. These effective yet gentle pads contain the active ingredient hydroquinone and when used in conjunction with sunscreen and sun avoid- ance measures help fade dark spots.